The Government of Arunachal Pradesh Police Department has released the notification for filling up the 241vacancies. 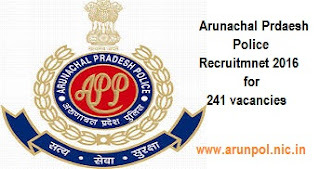 Mode of Apply: The candidates who are interested in the Arunachal Pradesh Recruitment you can apply n offline mode. The candidate should have passed the 10th for Head constable post and Constable Post. 5th class for General Constable female (Widow).8th for APST Male/Female. The candidate should have minimum of 18 years of age and maximum of 29 years. 26 years for constable, 33 years for Constable (driver) and 38 years for Staff. And Age relaxation applicable as per rules. The Date of scrutiny of documents and physical measurement: 09-12-2015 to 11-12-2015.